Louisville has the most rapidly growing urban heat island in the United States. Implementing these tactics could reverse that trend. Four years ago, Louisville, Kentucky, awoke to an alarming urban trend. This forward-thinking southern city—recently ranked as America’s most livable by the U.S. Conference of Mayors—had landed at the top of a decidedly less welcome list: researchers at Georgia Tech’s Urban Climate Lab reported that Louisville had the most rapidly growing urban heat island in the United States. Simply put, compared to its outlying rural areas, Louisville’s temperature was soaring. 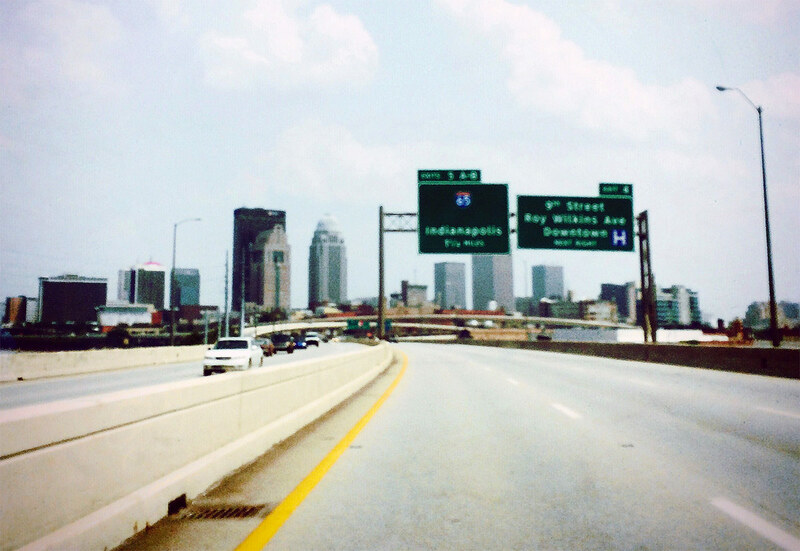 Driven by a variety of factors—few street trees, stagnant air masses, and miles of hot, impervious asphalt and rooftops—Louisville’s heat island was increasing by an average of 1.67°F per decade. That’s almost twice the rate of Phoenix, the next fastest growing urban heat island, and nearly seven times that of New York City. Most worrisome, excessive heat days in Louisville are expected to triple in the coming decades, bringing with them grave public health impacts for at-risk populations: the elderly, the very young, the chronically ill, the very poor, and the socially isolated. 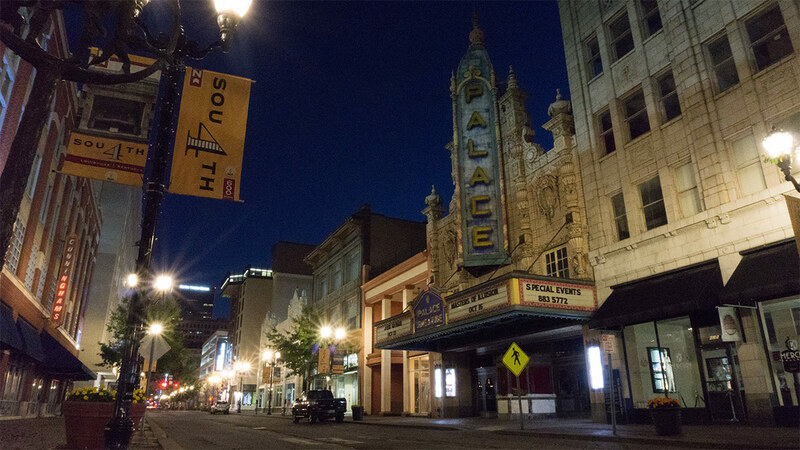 “Cities really amplify climate change,” said Brian Stone Jr., who directs the Urban Climate Lab and is now working with Louisville to forge what’s been called the most comprehensive urban heat island assessment and management plan in the country. Stone was speaking at a symposium late last year at New York City’s Center for Architecture that tackled an increasingly dire impact of our warming planet: extreme heat. Rising sea levels are often cited as a climate-induced catastrophe, but heat waves are far deadlier natural disasters— “silent killers,” as a recent American Journal of Preventative Medicine article put it, that leave no traces of destruction in their wake. Indeed, the authors note, extreme heat kills more people in the United States than hurricanes, lightning, tornadoes, floods, and earthquakes combined—about 400 people during an average summer. The dangers of unchecked urban heat are growing. Many cities are warming at more than twice the rate of the planet. As a consequence, the annual number of heat waves is increasing by 20 percent per decade in large U.S. cities. Those extreme heat events carry equally extreme impacts. The 1995 heat wave in Chicago killed more than 700 people, while the heat wave that struck Europe in 2003 caused an astonishing 72,225 deaths. Such grim statistics are the product of a long-observed phenomenon: cities are warmer than their adjacent rural and suburban regions. Known as the urban heat island effect, this condition can add between 2 and 10°F to a city’s ambient air temperature. Heat islands result from a combination of factors, including loss of vegetative cover, use of impervious materials, waste heat, and urban morphology, all of which boost urban heat levels. Beyond their human costs in heat-related mortality and illness, heat islands contribute to a host of other urban and environmental ills. As cities warm, so does the use of air-conditioning, in turn boosting peak energy loads that cause more frequent blackouts. On hot summer days, that same cooling demand increases air pollution, as older power plants are pulled online to meet peak demand. And waste heat ejected from buildings to keep them cool goes right back into the city, feeding a vicious heat-island cycle. So how can we build cities—and a society—more resilient to extreme heat? The good news is that a suite of relatively low-tech measures can make a sizable dent in heat-island impacts: cool roofs, cool pavements, and urban trees. The first two of these measures, cool roofs and pavements, use lighter-colored surfaces to increase the albedo, or reflective capacity, of the urban environment. On a hot summer day, a typical black roof can be 90°F above ambient air temperature, while a smooth white roof would be just 15°F hotter than the air. 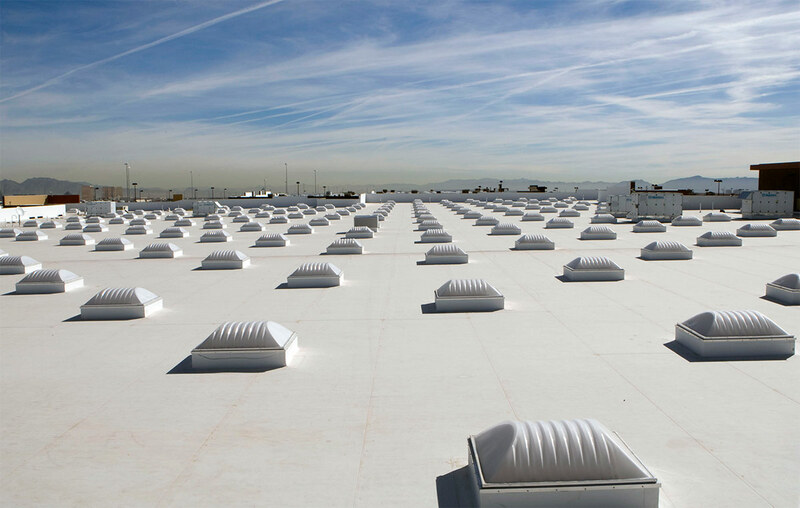 In other words, white roofs can cut surface temperatures by 75°F—a remarkable cooling effect. Studies suggest that if cool roofs were adopted across an entire metropolitan area, the cumulative heat island effect could be reduced by as much as 3°F. Rooftops are the low-hanging fruit for heat-island reduction. Take New York City, where roofs constitute 11.5 percent of the city’s total area—nearly one billion square feet. The city’s code now mandates that new and most replacement roofs be covered with white coatings to reflect light and heat into the atmosphere. One analysis found that, while cool roofs have a direct impact in cooling the building below them, the aggregate effect is even larger: if many buildings in New York had cool roofs, they would act to cool the entire city, reducing everyone’s cooling loads and providing an annual energy savings of more than $100 million. Given the large surface area of cities devoted to streets and sidewalks, cool pavements hold similar promise to cut down on urban heat. A Lawrence Berkeley National Lab study found that switching to lighter road surfaces could cut the heat island effect in large urban areas by 1°F. In cities like New York, where asphalt is commonly used instead of more reflective concrete due to the frequent need to rip up roadways for utility repairs, switching to light-colored aggregate could make a similar heat-island reduction. Unfortunately, such aggregates are markedly more expensive in New York City due to limited local availability, complicating the adoption of this straightforward solution. Then there are trees: nature’s cooling machines. Meter for meter, trees are the most effective urban cooling tactic. 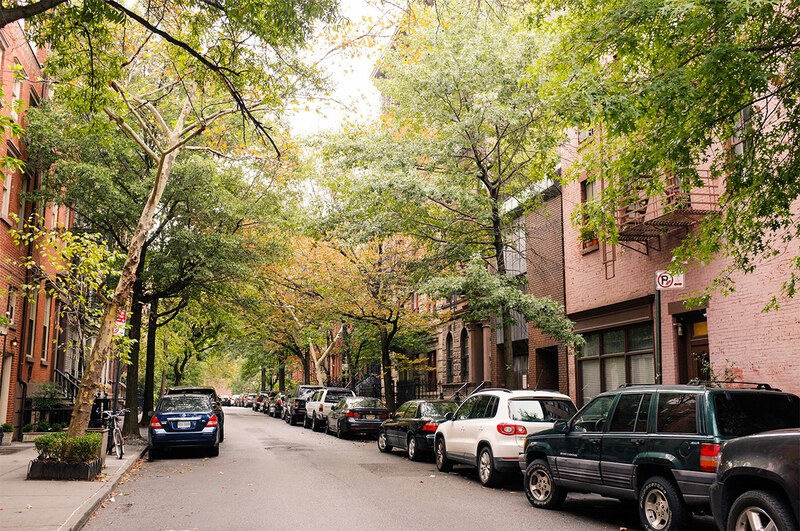 Street trees shade buildings and roads—not to mention pedestrians trudging through the heat—and cool the air through evapotranspiration, generating significant energy savings. Research suggests that a mature tree provides about 3 tons of free cooling as well as a range of ecological benefits, from stormwater absorption to biodiversity. 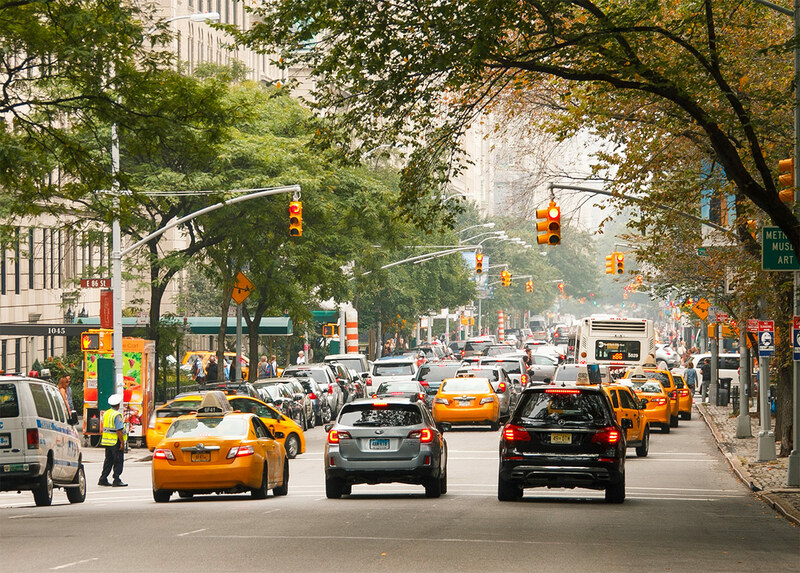 As these natural air conditioners are replaced with impervious surfaces, the loss of tree canopy is considered a key factor in extreme heat events. Studies suggest that when a city’s impervious surface area passes a threshold of 35 percent, heat island effects follow. (New York City is about 72 percent impervious.) And the most sprawling cities—which are paving over forested areas at more than twice the rate of compact metropolitan regions—have seen extreme heat events increase at more than double the rate of the most compact cities. How do strategies to reduce these impacts add up? 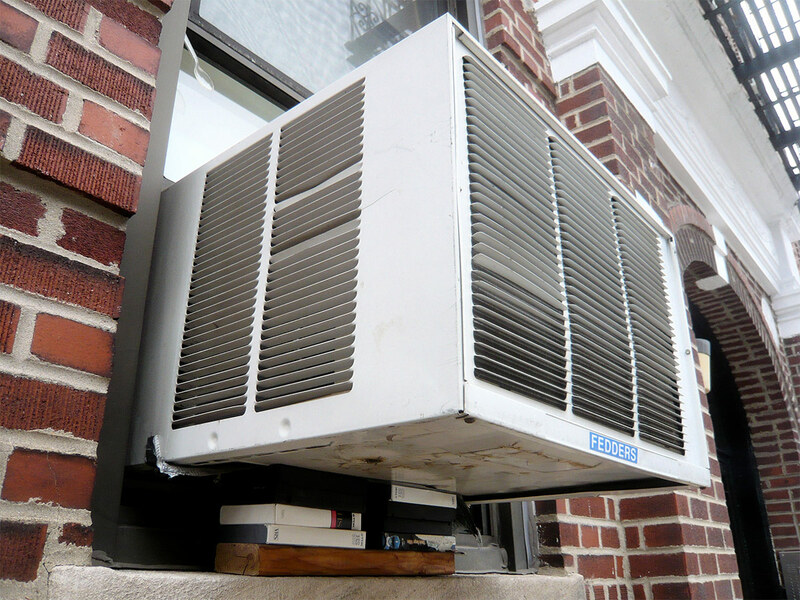 In 2004, New York City’s Department of Design and Construction (DDC) compared the cost-effectiveness of each heat-reduction measure. 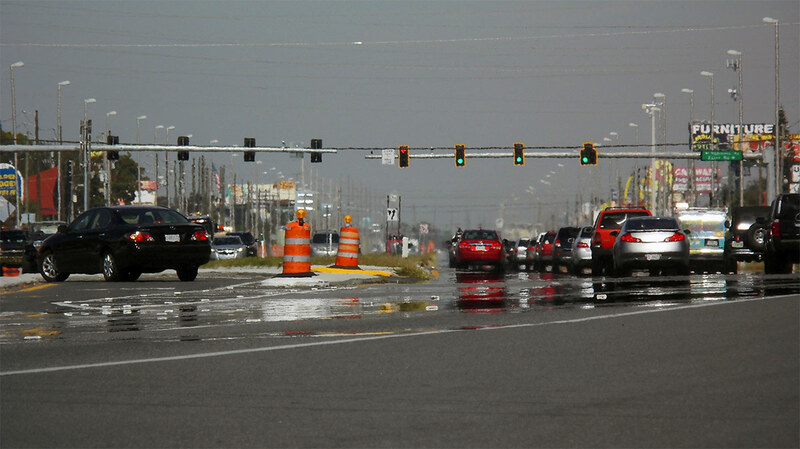 Using back-of-the-envelope calculations that looked solely at energy savings, the agency found that replacing standard roadway aggregate with light-colored aggregate yielded a one-year payback in energy savings. Both white roofs and street trees had a payback period of about 6 years, while more expensive green roofs had a 30-year payback. Extreme heat kills more people in the United States than hurricanes, lightning, tornadoes, floods, and earthquakes combined. The conclusion? If the city were to embark on a 20-year campaign to plant 500,000 street trees, replace every roof with cool roofs, and resurface roads using lighter-colored aggregate, up to half of the city’s heat island effect could be reversed—with a payback period of roughly 5 years. While cool surfaces and street trees are a necessary first step, it seems clear that growing public health threats from extreme heat will require far-reaching solutions. Among these are stronger policy frameworks to mandate heat-reducing urban features. “The most radical thing we could do is implement a landscape ordinance,” said Laurie Kerr, now the director of policy for the Urban Green Council in New York City and formerly the lead researcher for DDC’s work on cool city policies. Kerr pointed out in an interview that New York lacks comprehensive regulations for landscape design that could require a minimum amount of vegetative cover for a particular site. 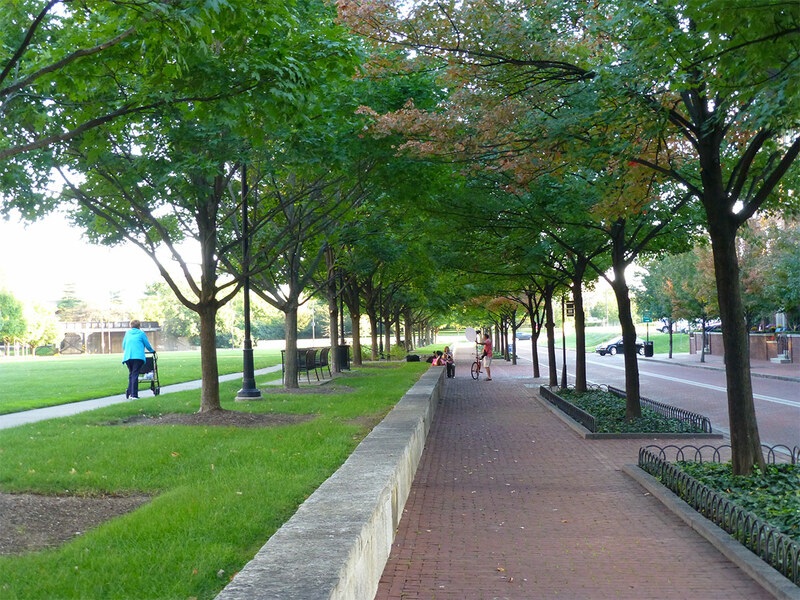 Other cities, such as Washington, D.C., have implemented a “green area ratio” that sets standards for sustainable landscape design. In Seattle, meanwhile, a points system allows property owners to select from a menu of strategies including green roofs, tree planting, or permeable paving to satisfy the requirement. That approach is now playing out in Louisville, where Brian Stone and the Urban Climate Lab are working on an urban heat mitigation plan that will make neighborhood-level recommendations to reduce heat mortality through tree planting, white and green roofs, cool paving materials, and other strategies, targeting each one to make the most impact in a particular location. The effort is focused on identifying factors that Louisville agencies can control. “The city wanted us to actually model feasible, land-cover changes that are tied to policy,” Stone told me. Advances in energy-efficient buildings that use passive cooling strategies to cut energy demand are another piece of the puzzle. And a growing topic of interest is waste heat, the sultry byproduct of air-conditioning units, vehicular traffic, industrial plants, and other infrastructure that drives heat-island growth. Understanding how such systems can be linked together to reuse waste heat instead of dumping it onto city streets is a promising next research frontier. No solution to extreme heat will succeed without facing another unsettling fact: neighborhoods with the highest temperatures and the least amount of open space and vegetation are also the most economically disadvantaged. In his eye-opening book on Chicago’s 1995 heat wave, sociologist Eric Klinenberg cited “significant associations between disaster mortality and neighborhood poverty, low-quality housing, lack of vegetation, and concentrated urban heat island effects.” Design strategies that boost social resilience, such as compact, walkable cities with high-quality public spaces, are essential to draw people out of their homes, foster social cohesion, and help reduce heat mortality. Conquering extreme heat is not going to be easy. Globally, 2015 was the hottest year on record. The frequency, duration, and intensity of heat waves are all on the rise worldwide. In cities like New York—where the heat island effect can be as much as 7°F—the combination of rising temperatures and economic inequality makes for a daunting public health challenge. 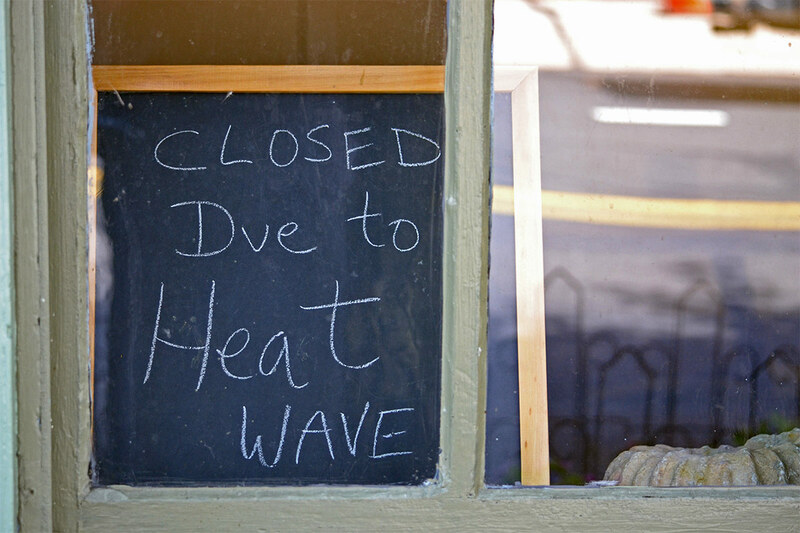 At a minimum, cooling strategies should be coupled with heat-wave preparedness plans to protect vulnerable populations. In the longer term, creative collaboration at the confluence of science, design, and policy will help us build cooler, greener cities that sequester carbon, capture stormwater, and—most of all—save lives.